Happy Friday everyone! I found this article from PetPav.com interesting and wanted to share it with you all. Many cat parents that I know feel bad about not letting their cats outside, I’m not one of them, but many do. Another reason why I don’t let Maggie outside, which is not listed in this article, is that our cats can cause injuries and/or death to other wildlife. I use bird feeders to draw birds and squirrels to our property to keep Maggie stimulated while keeping my feathered friends safe. I hope you enjoy this article. You can find lots of great animal related information at http://www.petpav.com. Are you a guilty cat owner who thinks your indoor cat really wants to go outside? For most of us, our indoor cats are pretty happy to just look outside or rest on a window perch and watch the birds outdoors. But, sometimes, our cats get the itch to go outside and there are many reasons why you should try to avoid it. Outdoor cats are more prone to infectious diseases because of encounters with wildlife and other outdoor pets. If your cat must be outside, make sure she is fully vaccinated and spayed, or neutered. And all it takes is one flea or tick that jumps on your cat while outside to start an entire infestation on your cat and even your home. An outdoor cat darting across the street is a perfect target for a moving vehicle and cats that are hit by cars rarely survive. Cats don’t know how to behave around cars. We may think of our cats as predators who are capable of taking care of themselves. Unfortunately, cats are commonly attacked by loose dogs, coyotes, and raccoons. Injuries or bites from wild animals and stray dog attacks are very serious and often fatal. 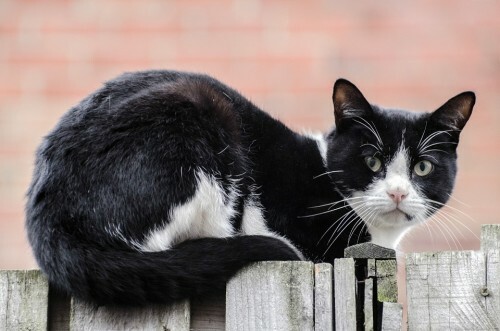 When you let your cat outside, your kitty can easily come into contact with toxins, such as fertilizer, bug spray or any other poison when outdoors. It is such an adventure for them, you don’t know what they literally lick up. Trees can be a source of some danger for cats who climb to a place where they are afraid or unable to climb down. In some cases, they may be up in a tree for days until they become so severely dehydrated and weak that they fall and suffer severe, serious or fatal injuries. If your let your cat outdoors, there is no guarantee that he or she can find her way back home. If your cat does not have claws, you really should not let your cat outside. Your kitty has absolutely no defense in any sort of attack. Make sure to provide your cat with a harness or a collar that includes an identification tag. Your cat must be fully vaccinated and are spayed or neutered. Attach a bell to their collar to alert people they are around and consider teaching your cat to walk on a leash.